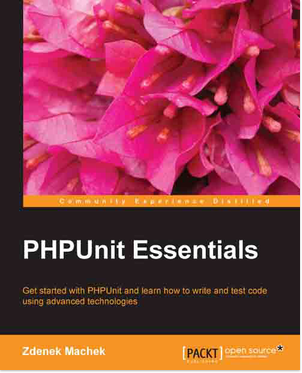 PHPUnit Essentials by Zdenek Machek is a modern and complete book about PHPUnit usage. I've been sent an electronic copy by Packt Publishing and am now reviewing it here. The first thing that struck me about the book was the breadth of subjects: you start from mocks and command line options, to get even to Selenium usage. You have to know your tools and given PHPUnit being a standard, this is all knowledge that will accompany you for several years. Every book on PHPUnit must be compared with the wonderful manual, to see what it adds to the picture with respect to the documentation. PHPUnit Essentials, in this respect, looks also at 3rd party libraries such as mocking libraries or "competitors" such as PHPSpec to enlarge the picture to the whole open source PHP landscape. This is something the documentations of single projects cannot do, and where a bit of opinionated advice can be taken. There is a bit of what may seem outdated information in the book such as how to perform a PEAR-based installation, but it's identified as such (PEAR being deprecated and dismissed by the end of the year.) Another seemingly outdated tool is Selenium IDE, but once upgraded with a formatter for Selenium2TestCase like explained in this book it becomes usable again. This kind of advice demonstrates the real world experience of the author and makes you trust the content. 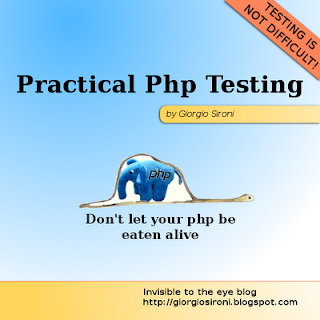 On the whole by reading this book you go in as a naive tester and you come out with lots of skills on using PHPUnit in different scenarios; so I would recommended it to programmers wanting to dive into testing PHP applications. Probably it's not worth a read for the medium-to-advanced users, for which most of the content is already known from PHPUnit manual or personal experience. After all the book's named Essentials, so it delivers all that you expect from the title in a convenient single package. Excellent - glad to see you getting back to some book reviews!